"He has just started calling us 'Amma' and 'Appa'. We were waiting for him to learn new words and had a lot of dreams for his future. But now, he is silenced by blood cancer. All I can hear are his screams of pain. In just 2 months, his health deteriorated quickly. He has become so weak that he can’t even crawl or move from side-to-side. " - Kanan, father of 1-year-old Kaushik. 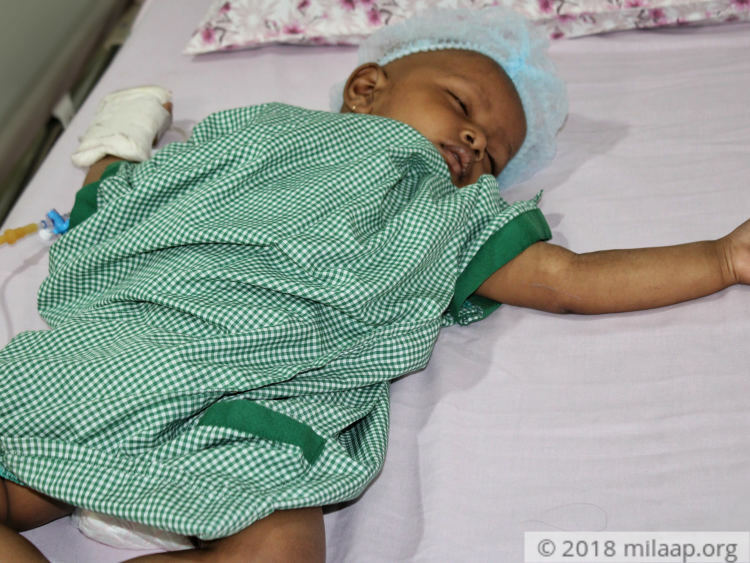 Little Koushik's is poked with needles every day and every time he is told that this is the last time. He trembles at the sight of nurse and doctors. His parents feel terrible seeing him in excruciating pain, but they are helpless. They're running out of time and money to save their baby. Koushik was an active boy, he is always seen playing in his small cycle with his 3-year-old brother, Vaibhav and their house was filled with their laughter. Despite the poverty, they were a happy family. 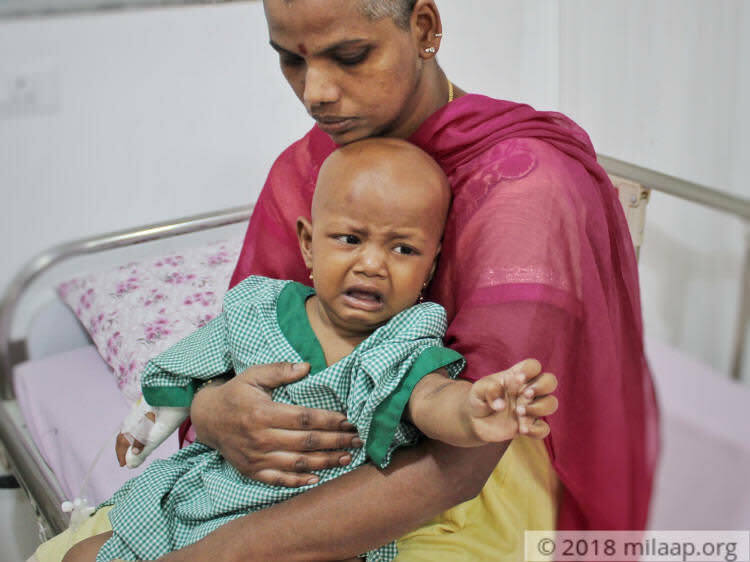 Their life completely changed when little Koushik, the angel of their family, was diagnosed with blood cancer. "He was playing on his cycle happily. I noticed a swelling around his neck. He never had any significant health issues before. He was always active and cheerful. But my motherly intuition knew that something is not right I took him to the hospital immediately, I prayed all the way to the hospital, I was willing to take all the pain and sorrows of my child, I didn't want him to suffer. When I heard it was 'cancer' I felt betrayed personally, I felt completely down by the whole world" - Tara, Mother. 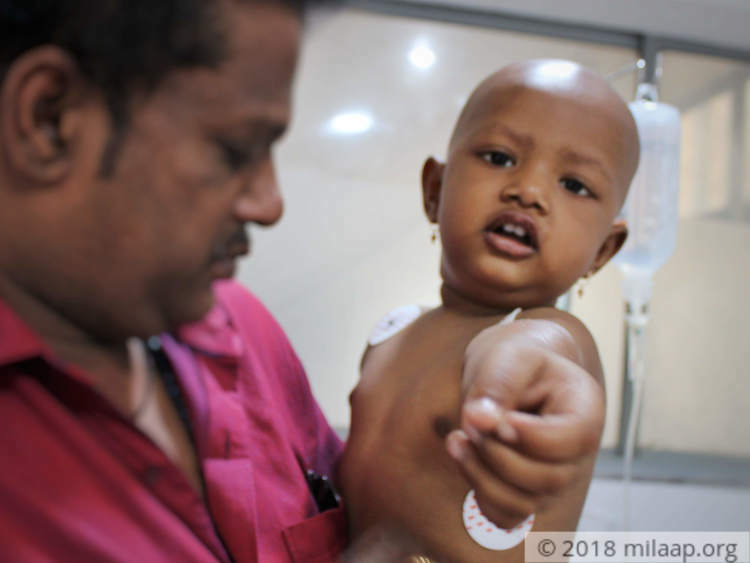 Koushik is diagnosed with a dreadful cancer T cell Acute Lymphoblastic Leukemia in which the white cells become abnormal and it is very aggressive and progresses quickly. 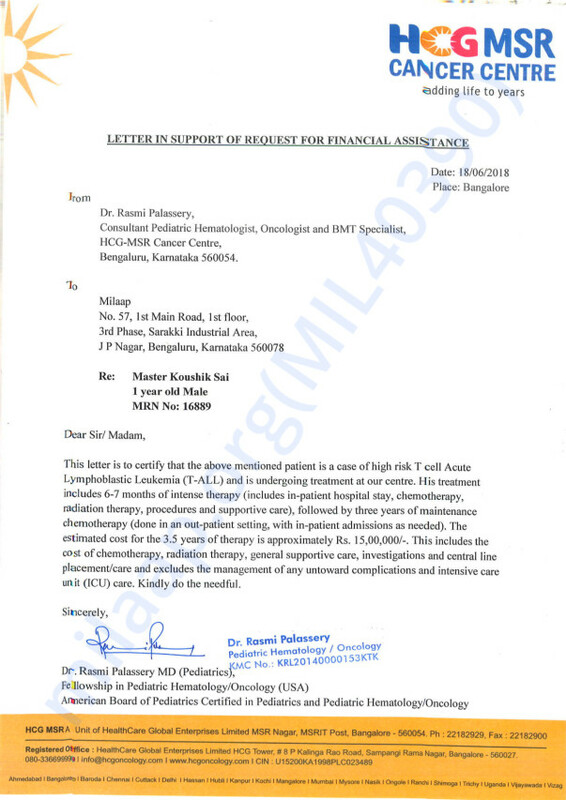 Koushik has started his chemotherapy but he needs to continue for the next 6 months at least. Koushik's mother was deeply disturbed and couldn't imagine the painful journey that her son is destined to go through. She was angry, broken, frustrated and the emotional turmoil was taking a toll on her health. 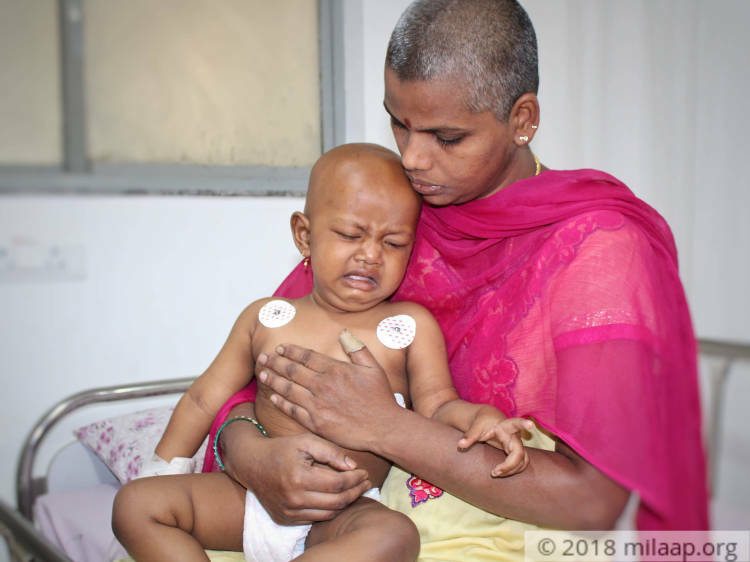 She shaved her head as an offering to God and she hopes desperately that a miracle at least takes away this dreadful cancer from him. Koushik's father Kannan works as a driver for a goods vehicle and earns Rs 15,000 per month, but his job is not stable. He has borrowed and spent 11 lakhs in just 2 months. 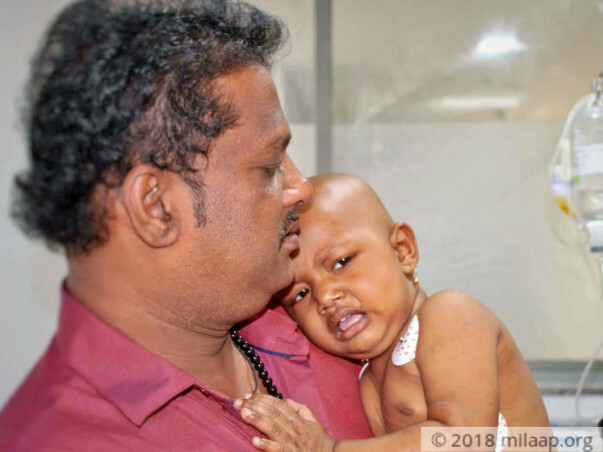 Koushik's condition is so critical and he cant delay his chemo cycles even for a day. He needs to be treated before cancer spreads everywhere and if that happens, it will be too late. He needs intense chemotherapy for the next 6 months at least. Only your help can save him. "He's crying all the time, he hardly sleeps. We have just started the treatment but we are already struggling to find a vein for the injections. His whole body pricked with needles. I can't see him suffering in pain. My wife and I beg you to save our son from this cruel pain." - Kanan. Your kind contribution can give this 1-year-old a chance to live his life! We are grateful for the love and support shown towards my son. He is currently in the hospital undergoing chemotherapy. Luckily, he has not been having any major side effects to the chemotherapy apart from hair fall. His brother was not a match to donate bone marrow so my wife and I are being tested as well. Please keep Koushik in your prayers, and continue to support him by sharing his campaign with your friends and family. Here's a quick update on Koushik's health. He is still undergoing treatment and supportive care . He is Planned for bone marrow transplant and his brother is identified as a potential donor. HLA matching has been done and the patient is responding well to the treatment and is doing well. Koushik is doing good and his stem cell donor HLA match has been done. Now we are planning for further treatment. currently he is taking chemo therapy and supportive care.